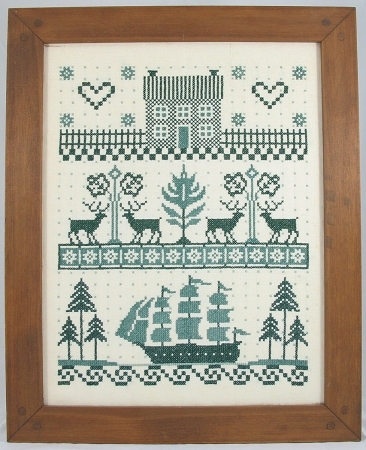 This cross stitch stamped sampler coverlet is sewn in three colors of green.A coverlet sampler that has all the familiar characters of a past era with a ship entering a river setting, deer waiting under trees and a house waiting for its family. If you want to sew this cross stitch printed sampler in three colors of blue ,then send us a separate e-mail/ comment after you place the order and we will honor your request. I have purchased and worked on many samplers from your wonderful selection of designs, from easy to hard, and have loved each and every one of them. This Ship Coverlet sampler appealed to me as I love the green shades, as well as the design. I just completed it and it is more spectacular "in person" than in the picture. The quality of the linen is excellent, the same with the thread.